Shortly after I became K8RC, I went to work for WKRC-TV, Cincinnati, Ohio. 48 years, 5 months and 12 days after it began (including over 39 years at WKRC), my broadcast career is coming to an end. From a teakettle AM station in southern Minnesota to the most-watched TV station in southwestern Ohio, it's been quite a ride. 16mm film and 2" videotape has given way to torrents of 1's and 0's for making pictures fly through the air. but with millions of transistors inside. As amazing as the march of technology has been, it provided only the tools of our craft. The key to our success has always been the people. I won't name a single one as there have been hundreds of the most creative and talented people imaginable. It has been an honor and privilege working with you these many years to inform and entertain our neighbors. I wish you all continued success to reward your diligent efforts for the people of Ohio, Kentucky and Indiana. I sent that memo out a few hours before the final newscast of my career. During that 11 pm newscast on July 30, 2015, I was honored with a small story just before weather, often the peak viewership of the show. Anchor Rob Braun wrote it and read it. Chief Photographer Kevin Jordan shot the video during the newscast on STAR64 an hour earlier. Director Curtis Mitchell called "Roll", Paul Knight pushed the button for the video and Joy Allender brought the audio up. Courtesy & ©2015 WKRC-TV & Sinclair Media III, Inc., Thanks to Hannah Jones and Marc Juszak. And with that, my career was over. Over 39 years is a lifetime for most of the people I had been working with in recent years. build our 1st live truck, Old Truck 7, featured in this "EDGE" promo. You can see Bob in this promo. He's the guy swinging the big dish :20 into the promo. WKRC-TV's microwave receivers are called "EDGE 1" and EDGE 2" to this day. Nick Clooney was the anchorman of the "Eyewitness 12" news team. Nick has referred to his years at Channel 12 as being the short interval between being Rosemary's little brother and George's Dad. Past Prime Playhouse was a comedy/movie show broadcast overnight each Saturday night. Bob Shreve as he did commercials and guest segments, all LIVE! and unscripted. or being Bob's "side-kick" while running audio in the booth. A parody promo for the PPP turns the "EDGE" into the "URGE". For more on PPP search YouTube. And now a few words about a good friend, Glenn Ryle. Glenn worked at Channel 12 for many, many years. So many, in fact, that we first "met" when I was a child. I was a member of the audience of The Skipper Ryle Show, a children's entertainment show he hosted for 17 years, from 1956 to 1973 on Channel 12. 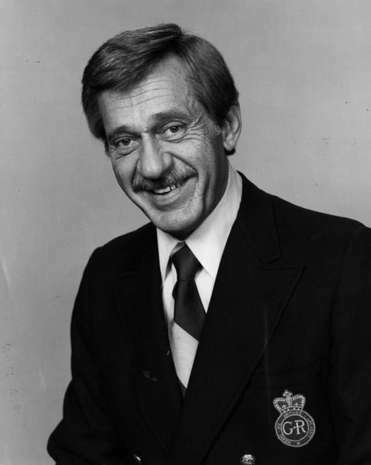 Glenn was a television jack-of-all-trades, as staff announcer, afternoon movie host and the MC of Bowling for Dollars. Glenn continued his work as weather and sports anchor on the morning and noon news shows in the 1980's. I ran camera on those shows and got into the habit of showing up for work an hour or more early just to sit and talk with Glenn before the show. Among other things, we found we had something in common; Glenn and his wife Jacqueline lived for many years in a house in the Cincinnati suburb city of Cheviot… across the street from the house where my father was born. Here's Glenn doing what he did best, being "The Voice" of WKRC-TV, with a commercial tag, legal ID and sign-off announcement. Notice the flag flying from WKRC's 1000' TV tower. The high winds at the top of the tower would shred a flag to ribbons in a matter of weeks. They spent a lot of money keeping that flag flying the whole year. The sign-off was also unique in that the formal announcement was followed by "This is My Country"
instead of the usual "National Anthem" or "America, The Beautiful". 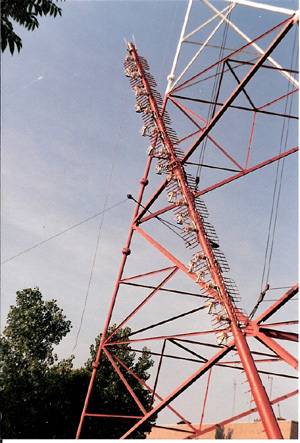 When I first came to Channel 12, the transmitter was an RCA 50KW of 1950s vintage that had been converted to color in the 60s. was a major challenge for the 24/7 transmitter crew. After a major outage that pretty much took out late afternoon and early evening prime time, the RCA had to go. 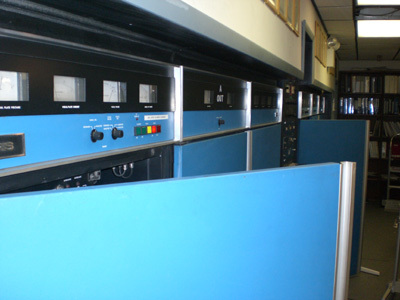 In 1978-79 we installed a pair of brand-new Harris 50KW television transmitters. using a single 8984 as the visual final driven by a single 8988. The aural section was a single 8807 driven by solid state IPAs. The far transmitter, designated TV50H, was the first production model of the new line. to set the vestigial sideband response at a low level rather than using a HUGE VSB filter on the output of the transmitter. 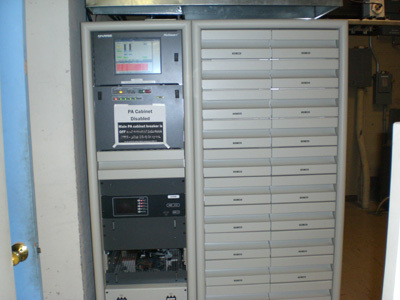 in consecutive years before being installed in our transmitter room. of cooling air necessary to keep the 8984 from, literally, melting. several revisions before the flow was sufficiently straight and non-turbulent enough to cool the tube. Until the cooling was perfected, the life of the $35,000 tube (1978 dollars) was sometimes measured in hours! we needed to double our transmitter power output. To do this, both transmitters were combined into one, designated a TV100H. 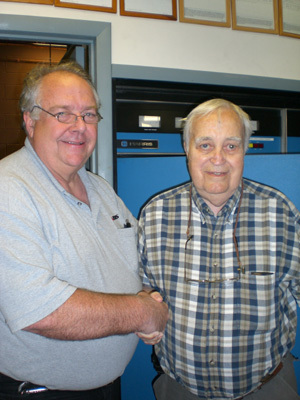 This is me (left) with my predecessor Bob Keeler, KG4BUH. Behind Bob is the Harris BT50H3 that was the "A" side of our analog TV100H transmitter. KG4BUH lit her up in 1979 and he came back on Jun 12, 2009 to shut her down for the final time. If you look carefully during this footage of the actual analog shutdown you'll spot KG4BUH, K8RC and K8RC's XYL, Jacquie. A short time later I fired up the new Harris Platinum-i ATSC digital transmitter on channel 12. That night also marked the end of "hollow state" (vacuum tube) operation at WKRC-TV. The new rig is all solid state. less power than the two blowers on the analog transmitter! 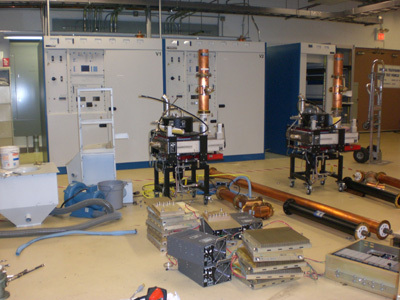 Note that the standby exciter is missing in this picture (lower left). 10 years suffered a double exciter failure two weeks before the transition date. channel 12 to channel 31. It kept us on the air for the last two weeks of channel 31 operation. A stack of solid-state IPA modules and power supplies are in the foreground. The two IOT cavity trolleys sit just in front of the PA cabinets. Photo/Video Credit: WKRC-TV, The Lovely Jacquie Craig.